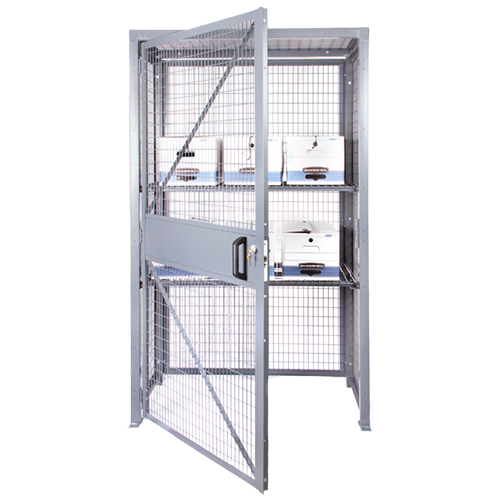 Loss prevention cabinets help you secure inventory where you store it, easily and quickly. Industrial-grade hinged doors have built-in cylinder locks. This unit includes a back, top, both sides, and door; bottom is not included as it is not needed for most applications. Please contact us if a bottom panel is required. Cabinets have two levels of shelving for separation of stored items. Frame: 14-gauge steel 2" x 2"
A key to pilferage control is securing valuable inventory “where it sits”— whether that is on the sales floor, in the back room, or in the warehouse. This cabinet provides ample space to store product under lock and key while allowing for easy visual inspection of contents. The open mesh design provides ventilation and will not block sprinkler systems. Optional shelving helps keep small to medium items more organized. Shelving supports are a custom addition, so be sure to order cabinet and shelves together.